"Blooms of Marble Cliff" is a charming name for a beautiful flower arrangement and was inspired by the city of Marble Cliff, Ohio. 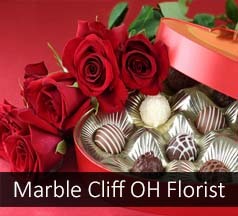 Flowerama makes daily same day flower delivery to Marble Cliff seven days week. With four real brick and mortar flower shops, award winning service and excellent prices its no wonder that Flowerama is the florist that the locals recommend. We deliver fresh flowers, roses, planters, cookies, and other flower arrangements to Marble Cliff and surrounding cities.